The former industrial area “Luciline” in Rouen, along the Seine river, has been re-designed profoundly into an ecodistrict (9 hectares in total), including both climate change adaptation and mitigation solutions. Sustainable living is the core principle of the neighbourhood re-design. Sustainability aspects are implemented by means of energy, water, biodiversity, transport and planning solutions that in most of the case play an important role for climate change adaption or mitigation. Measures include: a system of small canals connected to the Seine river improving drainage of water from buildings (rooftops in particular) and open spaces, green areas and tree corridors, heating and cooling system using ground water (prior to its release to the Seine River), energy saving in buildings, good access to public transport, easy accessibility of the area by foot and bicycle and compact building planning. The project for the ecodistrict has won a climate adaptation award (Trophées Ademe 2014 “Adaptation climatique et territoires”) and received the official ecodistrict label of the French Department of Sustainable Development. Additionally, the city of Rouen received the label “Territoire à énergie positive pour une croissance verte" from the Ministry of Environment. 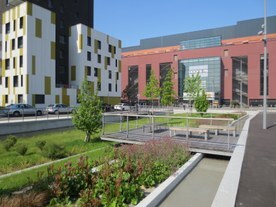 The re-design of the former industrial area of “Luciline” in Rouen into an ecodistrict aims to address, among the other, some of the typical climate change challenges that will affect urban areas, as: (i) increased temperature, contributing to aggravate the heat island effect, (ii) increased frequency and intensity of heavy rain water events and related impacts on stormwater drainage and management. The main challenge in the implementation of the project laid in its magnitude: the renovation of 9 hectares with multiple ambitious climate change adaptation and mitigation goals and the collaboration of the many involved actors and stakeholders was a complex and extensive mission. The main objective of the project was re-designing and re-developing a former industrial area into a sustainable new neighbourhood, providing residential, office and commercial functions. Sustainability has been considered the core principle of the whole project, expressed in terms of sustainable living, climate change adaptation, integrated water management, renewable energy production, climate change mitigation, sustainable mobility, limitation of urban sprawl, increase of green spaces. As a specific objective, the project aimed at minimising power consumption all over the process (from construction to management) and giving priority to solutions minimising maintenance requirements. 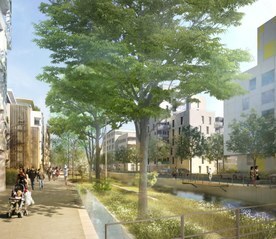 The project aimed to achieve an official French “Ecodistrict” qualification and to become a “Ville de Demain – Ecocité”. The former industrial area “Luciline” in Rouen, located along the Seine River, has been re-designed profoundly into an ecodistrict, including both climate change adaptation and mitigation solutions. The area covers 9 hectares and includes 1,000 new residential units, 30,000 square meters offices and almost 20,000 square meters commercial activities. Sustainable living is the core principle of the neighbourhood re-design. Sustainability aspects are implemented by means of energy, water, biodiversity, transport and planning solutions. Several measures, like the water management system, are relevant for adaptation to climate change and climate variability. One of the main function of the water management system (formed by small water canals) is to improve drainage of water after heavy rainfall events; to this regard rainwater flows through the small water canals connected to wide ditches (where the vegetation is growing), then to a greater canal and finally to the Seine river. Domestic wastewater is treated in the general urban wastewater treatment plant. The water areas are combined with several green infrastructure measures. Three hectares of green public space have been created around water courses, corresponding to about 30% of the total ecodistrict area (9 hectares). At the same time water courses, that previously were channelled under the ground, have been uncovered to improve connection with green areas and biodiversity of their banks. Tree green corridors have been planted in order to decrease the urban heat island effect, as they can prevent part of the radiation from reaching the streets, thus creating a comfortable microclimate. A non-specified amount of vegetated rooftops will be created, which will help reducing the urban heat island effect and improve rainwater drainage. Moreover, the total area covered by buildings is minimised to 135,000 square meters, in order to create as much open space as possible, thus contributing to decrease the urban heat island effect and preventing urban sprawl. Mitigation solutions focuses on renewable energy production and energy saving. An urban network is used for distributing water for heating in winter and cooling in summer. Relatively warm and cold water is provided by 6 sources from the deeper water layers (4-5 meters depth) of the Seine River (aiming to cover 60% of the heat supply). Three boilers powered by gas provide additional heating capacity. Energy saving is achieved by efficient building performance; buildings will be accredited with “very high energy performance” (40% less energy consumption than conventional buildings, and maximally 65 kWh/squared meter/year). Moreover, low-carbon transport and mobility is encouraged in several ways. 25 kilometres of quays and pedestrian and slow traffic pathways have been constructed. Additionally, three lines of fast public transport (including dedicated lanes for public transport) connect the neighbourhood with the transport system of the close (1.3 km) city of Rouen. The dialogue with the population of the city is explicitly obliged by the framework of the “urban development zone” (ZAC) procedure. Therefore, public consultations have been organised in order to involve the civil society, i.e. citizens and their associations. A wide number of actors have been involved in the realisation of the project. This was an initiative launched and co-organised by “Métropole Rouen Normandie” and the City of Rouen. The project is coordinated by the project development agency “Rouen Normandie Aménagement”. The Haute Normandie region also supported the project. European support has been received by means of the Future Cities project, which is part of the INTERREG IBV program and which received funding from the Fonds Européen de Développement Economique et Régional (FEDER). Substantial funding has been provided by the European Investment Bank. The neighbourhood is subdivided in 13 building blocks (“ilots” – small islands), which are developed by different developers and architects. ADEME (the Environment and energy management agency) has advised the project on environmental and energy matters, for example in the development of a “heat fund” (Fonds Chaleur) to save money for future investments on the heat network. Advice has been given by EPF Normandie (Institution for public space development), CAUE (Architectural, urbanism and environmental consulting), OGI (Research & development of public space) and H. Pénicaud (Environmental research). The heat distribution service is, after a public procurement procedure, awarded to the company GDF Suez Energie Services – Cofely for a period of maximally 25 years. GDF has to develop, build, finance and exploit the heat network. Explicit and strong political commitment is named as one of the major success factors of the re-design of the former industrial area of “Luciline” into an ecodistrict. The political commitment was essential for the development and achievements of a project of this magnitude. The commitment of the city was not only strong in political terms, but also financially: they supported the project with about 28 million euros, which forms a substantial part of the total budget and thus helped the project in its success. The initiators (the city of Rouen and “Metropole Rouen Normandie”) of the project managed to obtain several different subsidies (e.g. INTERREG, Ville de Demain), which helped in achieving goals. Compared to the total budget spent, these subsidies are not the largest part of the budget, but they have been supportive for specific activities (further explained in the section “Costs and Benefits”). Moreover, the European project Future Cities, funded by INTERREG, improved the Rouen achievement due to the experience exchange with other cities, particularly Nijmegen (on planted roofs) and Arnhem (on urban heat island modelling). The project planning and organisation followed the Environmental Approach to Urban Planning methodology (Approche Environnementale de l'Urbanisme, AEU) of the advising company ADEME. This approach started with exploration of the areas and the identification of strengths, weaknesses, risks and priorities with respect to climate change. This phase was followed by the development of a general master plan and four focus areas: (i) contractual provisions for property concession, (ii) construction of a geothermal heat network, (iii) improvement of certain sections such as water management, climate change and urban heat effect, and (iv) raising public awareness. The involvement and consultation of many different stakeholders has also contributed to the project’s success, although it was also a major challenge to organise a project with so many parties. The coordination of different parties and discussions about their skills and limitations have improved the working process. The users have been involved in the development process in order to create public awareness and commitment. Finally, the project is supported by a monitoring and evaluation programme, in order to enable adaptive, flexible management, which is as a key factor in effective adaptation strategies according to the project’s report. This is most relevant for the urban heat system, because the optimal functioning of the system can only be investigated during its operation. One of the limiting factors in the project was time management, due to the fact that before the start of the project there were still a few companies and private land owners in the area to be re-planned and re-designed. It cost more time than initially planned to organise the agreements with these land owners. As a solution for this time management issue, the project was divided in phases. The total project cost of only the Quartier Luciline is about 50 million euros, which are mainly composed of the acquisition, research and building costs. The cost of the heat and cold system is estimated at 5 million euros. After correcting for subsidies and prepayment by future customers, the net investment by the heat supplier (EDF) was 2.5 million Euros. The major investor in the project was the city of Rouen; they invested 28 million euros in the quartier Luciline. Additionally, several European and national funding programs have contributed. In total, the project received about 2 million euros from European and national subsidies. The third important financer was the EPF Normandie (institution for public space development). 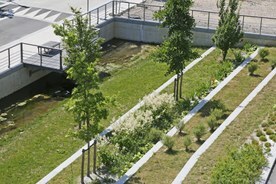 The water management plan was partly funded by “Ville de Demain – EcoCité”; 0.7 million euros were funded by the state. The Luciline project participated in the Future Cities project, which is part of European programme INTERREG, which is funded by the European FEDER. Rouen received 0.6 million euros from this project. The European Investment Bank (EIB) has provided a loan of about 25 million Euros. The investment costs of the ecodistrict results in long-term benefits for the area. The main benefit of the project is that an abandoned area is transformed in an attractive area for citizens and companies, thereby making the area and the whole city more (economically and personally) appealing. Additionally, the new built apartments and offices are financially attractive for new users due to the lower energy costs. The European label CAP CIT'ERGIE was attributed for these commitments on 30 January 2014. Contractual provisions for property sales have been documented in a so called CPAUPE, stipulating architectural, urban planning, landscaping and environmental requirements for public spaces and private properties in the eco-neighbourhood. The partners who are building on the site have to comply with these stipulations. Key milestones: 2006 - concession agreement; 2008 to 2011 - regulatory studies for the creation and development of a Joint Development Zone; 2012 - beginning of sale launches and land acquisitions; 2012 to 2016: work on the public areas; 2025: achievement of the Joint Development Zone. The maintenance of the geothermal heat network will be controlled during 25 years by the company which has built it. After that, “Metropole Rouen Normandie” will maintain the network. On top of that, “Ville de Rouen” and “Metropole Rouen Normandie” will maintain public spaces such as roads, sidewalks, vegetation, small canals, ditches, the canal, hydraulic pumps, water courses (under the ground and uncovered).